True to its name, Olive Bistro has a very warm European feel to it. The ambience includes pots and pans-shaped lighting and a mini-van painted with graffiti. Their service can be a bit slow on some days, so don't expect to go for a quick office lunch and scoot. The food is outstanding and portion sizes are fairly generous for people to share. It's great value for money too. Their service could be faster. It's also a small place, and the tables are quite close to each other. Reservation is a must, as the place gets full due to its location in a mall and proximity to office complexes. The food is flavourful and is excellent value for money. They also have a limited menu from their sister restaurant SodaBottleOpenerWala. 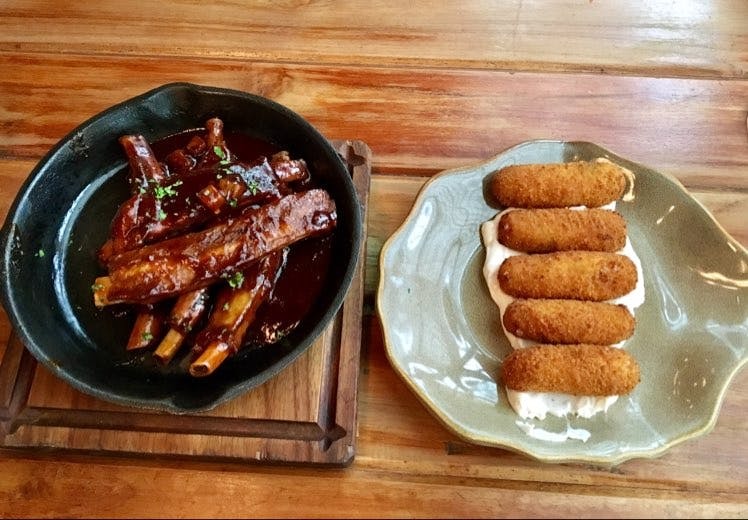 Their gourmet pizzas are one of the best in the city; also do try their main course, especially the grilled prawns, the river sole and the lamb chops. Vegetarians don't despair, there are quite a few options available for you! They have pastas and risottos to choose from. The starters have some interesting items like dips on ribs, which are ribs in a Pineapple and Chilli glaze. Also do try the Poppers' Stop, which is a cheesy corn and jalapeño croquette. The alcohol is pricey but they often have offers running, so do ask for those. Their dessert options are unique, especially 'Seventh Heaven'. On the whole, a lovely dining experience!